Le mercredi 11 octobre 2006. 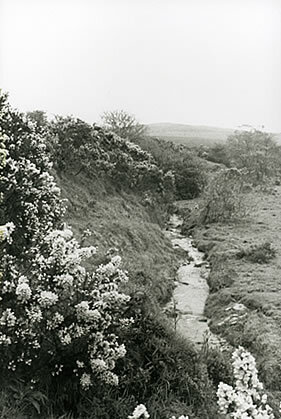 Jamaica Inn, set in Cornwall, exemplifies Daphne du Maurier’s greatest writing skills. ln this undeniably "Cornish" novel, Daphne du Maurier obviously excels in presenting Cornwall’s landscape and history, for her knowledge of the area was unquestionable. Being a tremendous walker, Daphne du Maurier knew every inch of the county. Yet, Jamaica Inn, the inn which inspired the subject of her book, was discovered by chance. While riding across the Moors she and her friend Foy Quiller-Couch got lost in sudden darkness, surrounded by the thick fog of the bleak landscape of Bodrnin Moor. Bodrnin Moor is a wild strech of moorland extending from Dartmoor to the Land’s End peninsula and the isles of Scilly. This striking landscape is characterized by its areas of marshland, its few stunted trees and the rocky formations known as tors. Held at the mercy of this hostile place, Daphne du Maurier recalls the circumstances of their hazardous expedition in Vanishing Cornwall . "Bogs, quarries, brooks, boulders, hell on every side, we led the horses from the slippery track, and then got up on our saddles again. l remembered an illustration from a book read long ago in childhood, Sintram, And His Companions where a dispirited knight had travelled such a journey with the Devil in disguise, who called himself The Little Master. It showed a terrified steed rearing near a precipice. This was to be our fate, and The Little Master would come and claim us." After several hours spent in the desolate moorland, fear finally vanished when the "gaunt chimneys of Jamaica Inn" suddenly appeared out of the darkness. Once inside Jamaica Inn Daphne du Maurier learnt about smuggling and wrecking, and about the different stories and legends of the Moors, where contraband may have been hidden. The isolated inn, situated almost halfway between Bodmin and Launceston certainly played its part during the heyday of smuggling for it was a halting-place for the contraband intended to be distributed in the surrounding areas. The unusual and exotic name (for such an area) "Jamaica Inn" may have taken its origins from the rum trade in which it was possibly involved. The novel, inspired by the inn, its bleak surroundings and the smuggling activity of the area, became Daphne du Maurier’s first huge commercial success. However, the novel’ s obvious connections with wrecking can still give rise to controversy. Indeed, if smuggling was an activity which allowed the poverty-stricken people of Cornwall to circumvent the duties regularly levied on goods, the tales of the wreckers could possibly be purely fictional. Rescuing shipwrecks stranded on the reef because of the area’s rough elemental weather was a routine activity on the inhospitable Cornish coast, and the locals certainly left the place with the few things washed ashore by the tide. But this behaviour had nothing to do with the savage and barbarie image of the wreckers echoed in sensational touristic stories.
" His Majesty’s Government were prepared to take certain steps during the coming year to patrol the coasts of His Majesty’s country. There will be watchers on the cliffs instead of flares [ … ]"(152). Daphne du Maurier did not only fuel her writing with historical facts. Among the various places that Daphne du Maurier borrowed from reality was the village of Altarnum and its vicarage which shelters the wicked Vicar in the novel, and the magnificfent church known as the "Cathedral of the Moor" which dated from the fifteenth century and hasn’t faded with time. It is also said that there is still a ’Jory’ family living in one of the villages of the Moors that might have inspired one of the character’s names (Tom Jory) in Daphne du Maurier’s novel. Maybe her borrowings from reality find an explanation in one of her letters to Oriel Malet. Mentioning the relation between her fictional works and readers she wrote, "It is the mixture of reality with fiction that gets them" . The mixture between reality and fiction obviously succeeded in drawing an impressive portrait of Cornwall, for the descriptions of the moors are, according to Martin Shallcross, "undoubtedly some of the finest in any Cornish novel" . Yet, however accurate the real details used by the writer, it seems nececessary to set the novel back into its purely fictional context to understand the subtleties of du Maurier’s writing. ln fact, the Cornwall described by Daphne du Maurier was entirely fashioned from her imagination and it is this very imagination that allowed the writer to recreate a sense of the past. On this point, Daphne du Maurier wrote "imagination, yes, but so that you use it to perceive the past and relive it" . But Daphne du Maurier’s imagination did not only fulfil her desire to uncover the past, it also allowed countless readers to enjoy the sheer suspense and thrill maintained right from the first chapter when Mary is on the road ta Jamaica Inn, to the denouement when she escapes from the criminal Vicar’s clutches. A study of Daphne du Maurier’s treatment of the plot will reveal how suspense and mystery govern the whole story. Daphne du Maurier. Vanishing Cornwall, Harmondsworth, Penguin Books, 1972 (145-146). Jenkin, A.K Hamilton. Cornwall and its people London : David and Charles INC, 1970 (42).